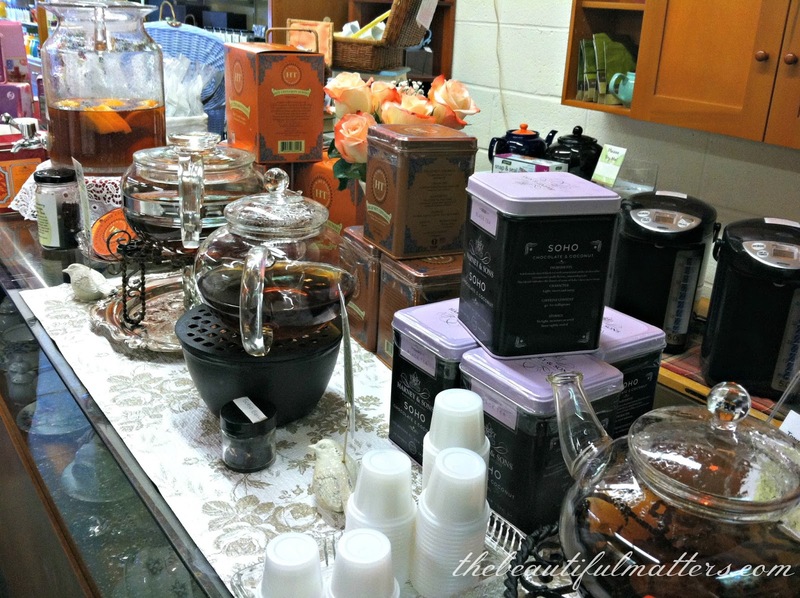 Our local tea shop, TranquiliTea, was having a tea tasting this past weekend, featuring Harney & Sons teas. My daughter and I stopped by to check it out. Six or seven teas were available for testing. I tried Harney's Tower of London, a black tea with dried stone fruit, oil of bergamot, and honey. Their Soho tea is flavored with chocolate and coconut. My favorite was the 30th Anniversary Blend tea, a blend of Assam and Ceylon, with Chinese Silver Needle and Yunnan Golden Tips. All of the teapots were atop tea warmers with little tea lights in them. 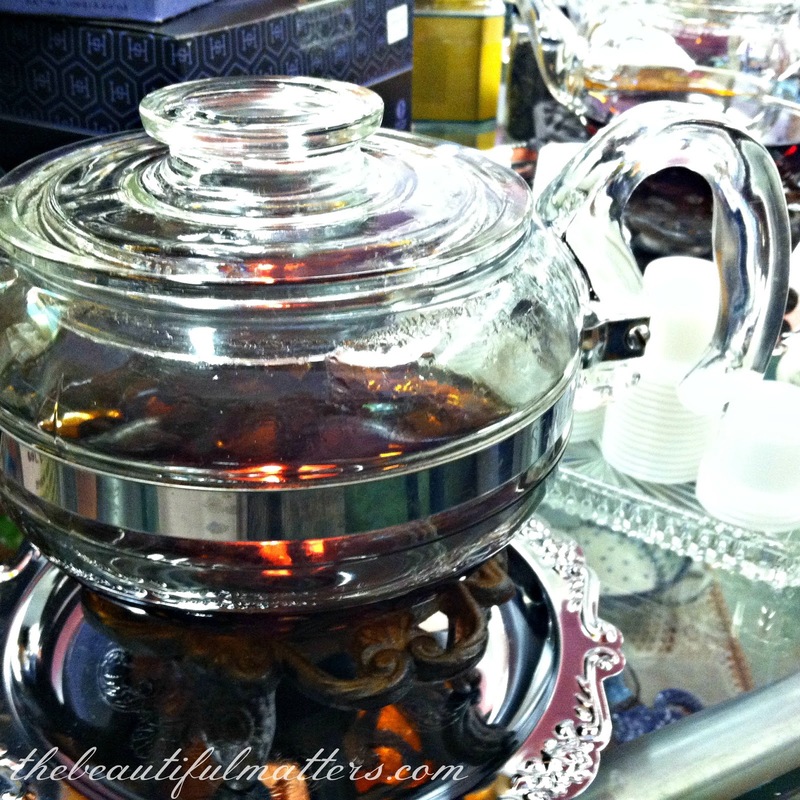 Several years ago, I bought one similar to the one shown under the teapot below. This shop is where I recently got my pink teapot, featured here, when they were having a Downton Abbey tea tasting party. 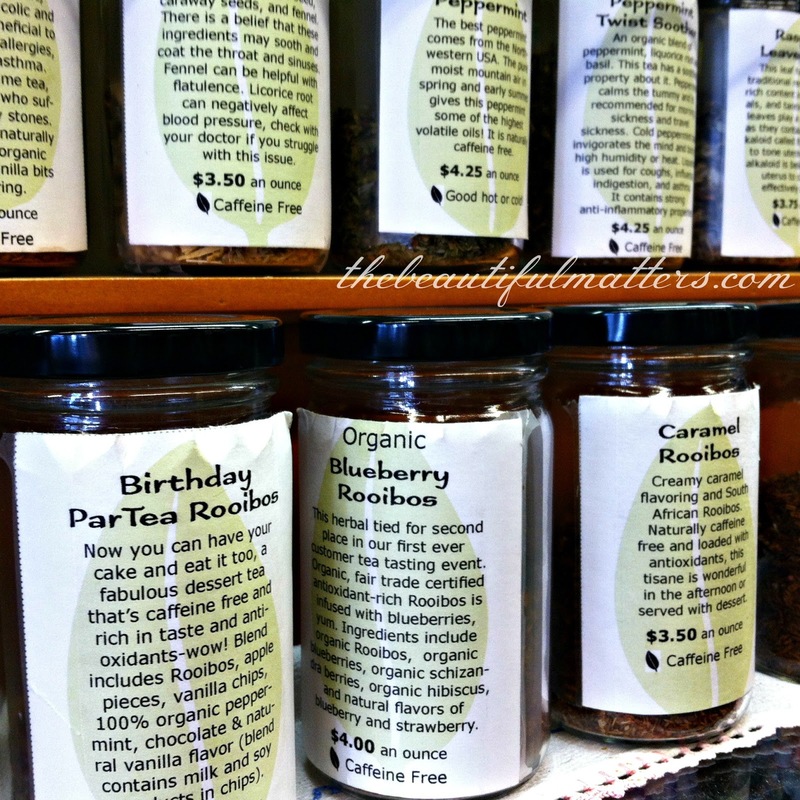 So many different kinds of tea to choose from in this shop -- herbals, rooibos, green, white, decaf. Lots of different flavors. Try as I have, I never seem to stray far from my favorite blacks -- Assam, Darjeeling, English Breakfast, Ceylon . . . This wasn't available to test, but I didn't think I could go wrong with Scottish Morn, being half Scottish and all. I purchased some. Look at this cute book they had for sale, entitled Princess Tea. And princess teas, too, including a Snow White tea (with apple of course), Sleeping Beauty tea (with chamomile), and Cinderella tea (with pumpkin), all caffeine free. How cute is that? Wish I could borrow some little girls and have a party! I had to try the Scottish Morn tea when I got home, even though it was no longer morn. 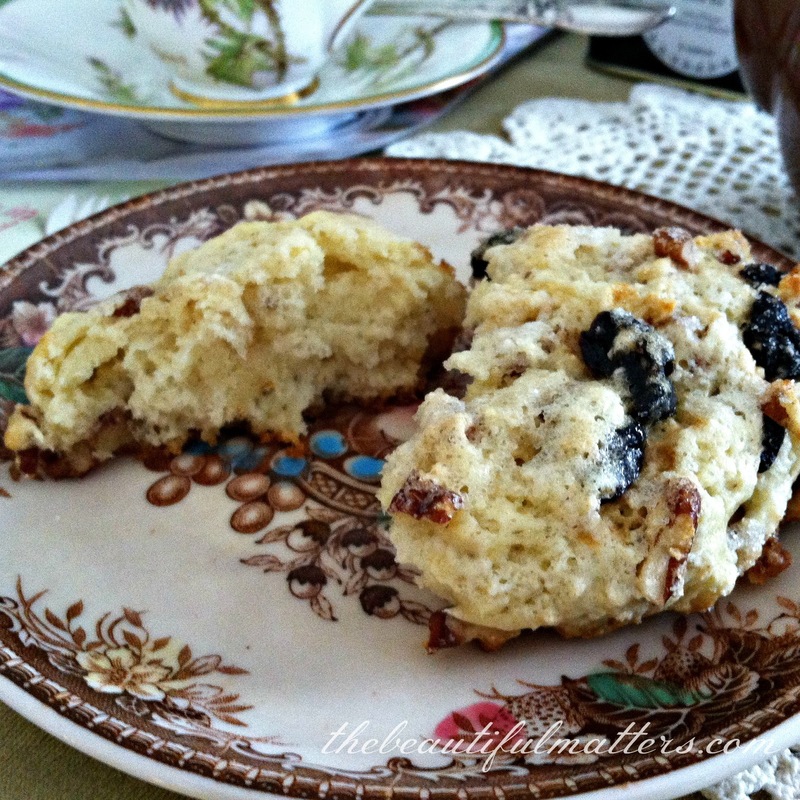 I made some cherry pecan scones and a little pot of tea, not wishing to have too much caffeine later in the day. I definitely like this tea! Although rose petals and lavender and vanilla and such all sound wonderful in tea, just give me some good black and I'm happy. 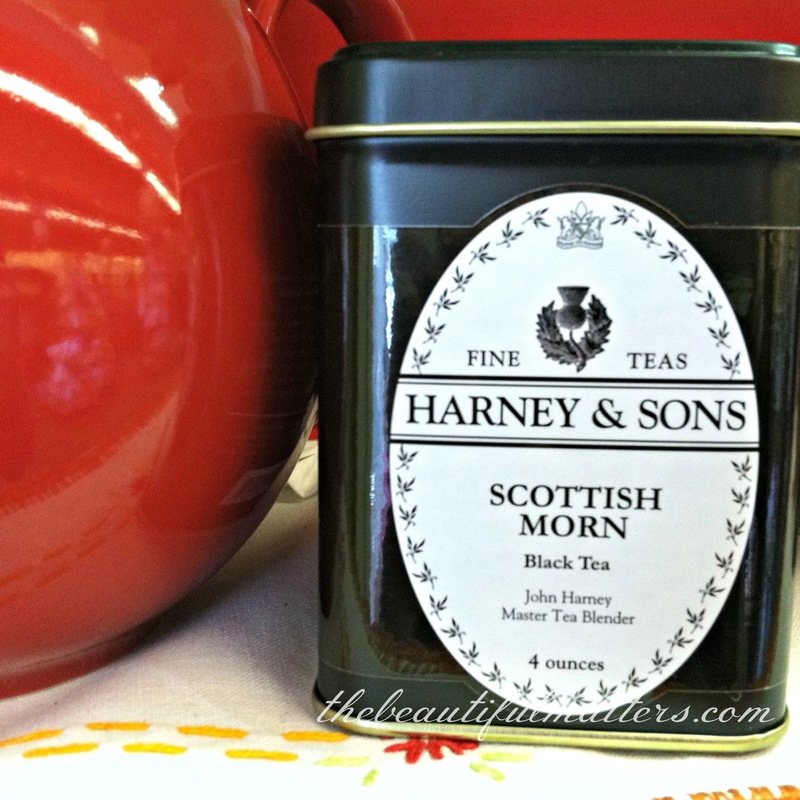 The Harney & Sons website says that this is perhaps the strongest tea they offer, and that it is meant to be drunk with milk, as the Scots do. Sometimes I do go all out and add milk and sugar to my tea. When I drink tea this way, it almost feels like a meal in itself. Of course, I had to drink it from the Royal Doulton teacup with the thistle, the official emblem of Scotland. The back of the cup says that this is the Glamis thistle, a thistle found near Glamis Castle in Scotland. A quick internet search tells me that this is the most "haunted" castle in Scotland, so I think I need to do a post on this teacup and research the history surrounding the castle! These are the best scones ever. Really. I will post the recipe later this week. I'll be linking with . . . 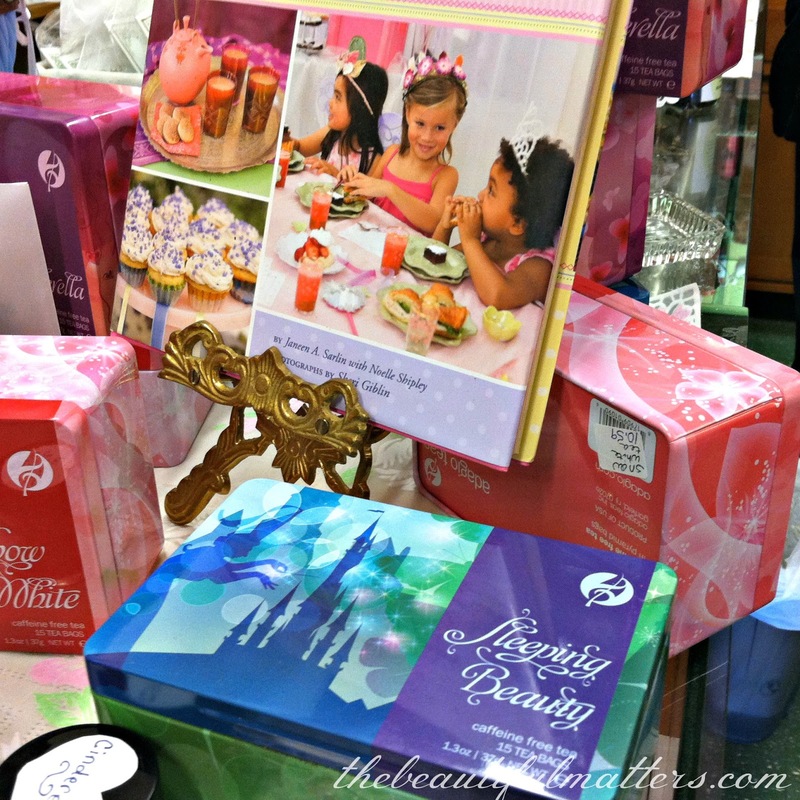 I love this post - very fun since I sell Harney Teas! 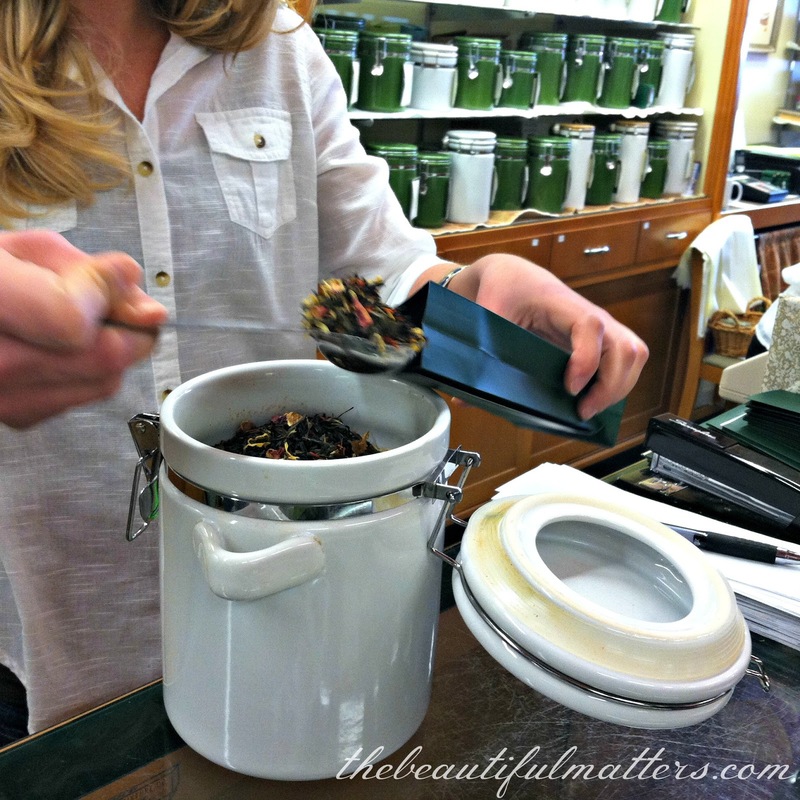 Tea tastings are always fun and I like any of the Harney and Sons blends I've tried. They're not readily available here but I can probably order them on-line. Your scones look yummy. This looks wonderful! What a fun store. Your taste in tea sounds like mine. I prefer the black teas , but appreciate good green teas too, but please, no vanilla, chocolate, or other such flavors added. Same with coffee, I prefer it black, or on occasion, with real cream, but again, no other flavoring. 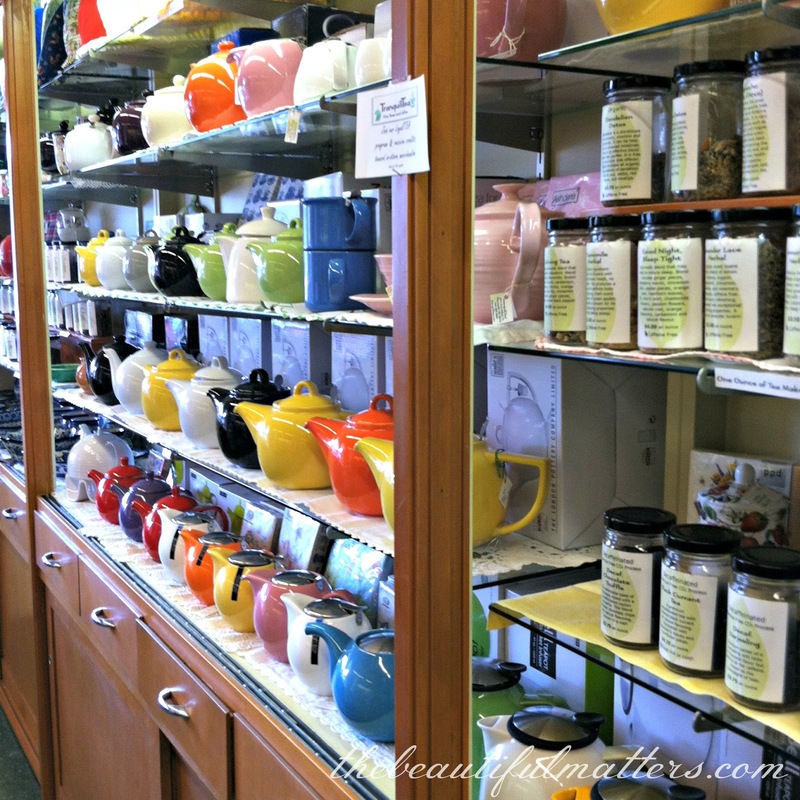 I do not think we have any tea shops quite like yours close to home, but I think a visit to Seattle or Portland, OR ( close to me ) would yield a tea shop or two. I am thinking about a day rip to such a shop with some granddaughters, and very soon too. The haunted castle sounds interesting and a little bit spooky. I love Harney and Sons tea. I buy their Paris Tea and Hot Cinnamon Spice in bulk. I add their Lavender to my Paris tea and I tell you, I am in love, love, love. That Scottish tea is tempting...we went to Scotland in 2003 and one of our main goals was to have high tea. It happened once but not at the venue (Willow Tea Room) I had hoped for. And you have given me a good idea. 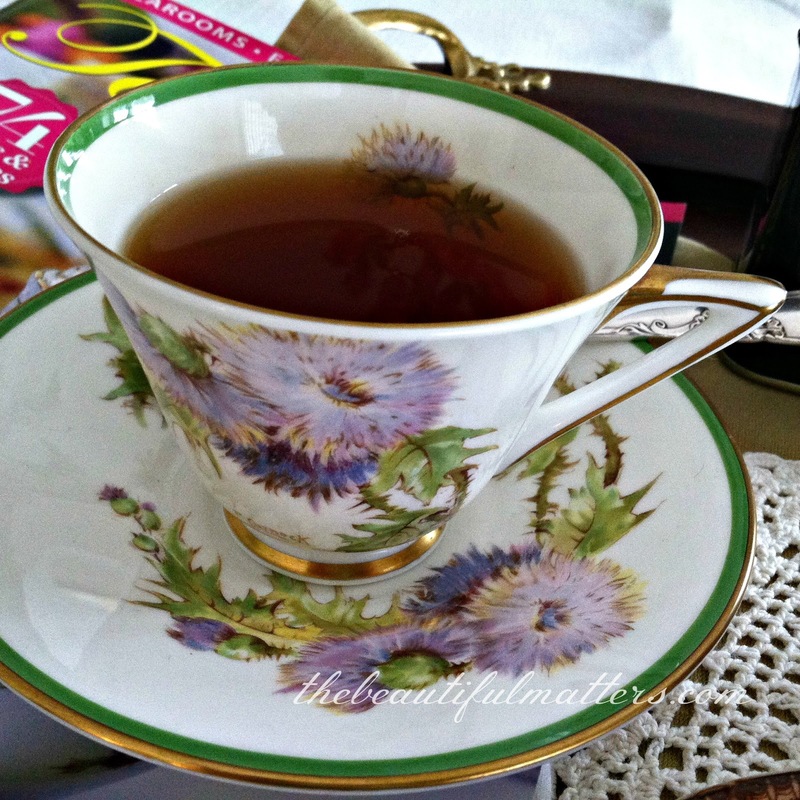 I love that you are drinking the Scot tea in a thistle teacup. I should try to find a teacup with "heather" on it. How cool would that be? Waiting for your scone recipe! I love this store. I am sure it was a great place to visit and shop in. So many choices. Your tea tray is very lovely and inviting. I'm very jealous of your local tea shop and tea tasting! Harney and Sons teas are the best :). What did you think of Tower of London? It's one of my favorites. I love your Scottish tea cup for your Scottish Morn tea. I was looking in the Harney catalog recently and saw Scottish morn, and my first thought was, that's probably way to strong for me! Maybe I've gotten too into the blends that I'm becoming a tea wimp. Sometimes a really strong tea can be bitter and upset my stomach. Then I put some milk in, and maybe sugar. I am really pleasantly surprised that the Scottish morn tea is very smooth, even when I let it steep the full 5 minutes. I really love it. The Tower of London tea was good, but I'm not so much into flavorings. A whole new world of tea would open up if I was! I laughed at your "tea wimp" comment! Thanks for visiting. This was fun to read about and see. I am a coffee drinker for morning wakeup but like some decaf tea later in the day. My grandparents had basic Lipton tea and I was raised to drink it black. This looks like such a fun shop. I bet it smells fabulous! Tea time with girls is always fun. I think I need to have one this summer with my grands. It's been a while since I did. The scones look delicious and love that pretty teacup. Thanks for sharing with SYC. May I admit ... I'm jealous of your tea shop? I'd love to attend a tea tasting, and apparently you and I have almost identical taste in teas: Assam, Darjeeling -- really, I just want a good black tea, not too strong. 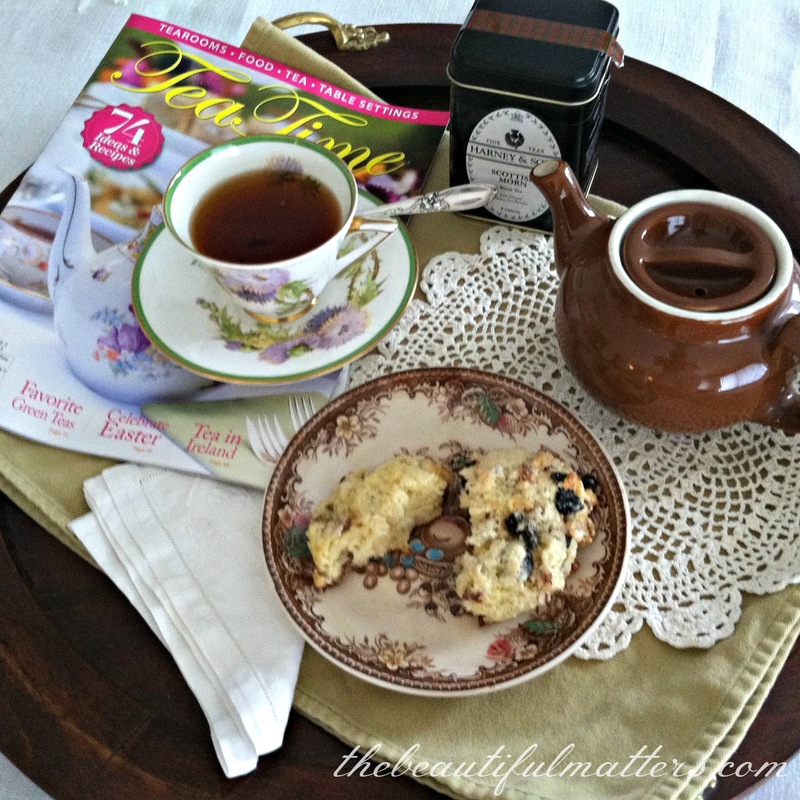 I don't like green teas b/c they taste too grassy to me :) Can't wait for that scone recipe! They look perfect. And as I recall from reading Shakespeare's "Macbeth," Glamis is Macbeth's family name, so perhaps the castle is haunted b/c of that violent man and his deeds? Interesting! I didn't know there was a real Glamis.